Well. Insatiable shopper that I am, I just popped over to see what was left in the Hush sale and snapped up two rather nice-looking items. Just some basics to carry me through until the end of summer, as I sit at my desk writing my dissertation and basically having no life. 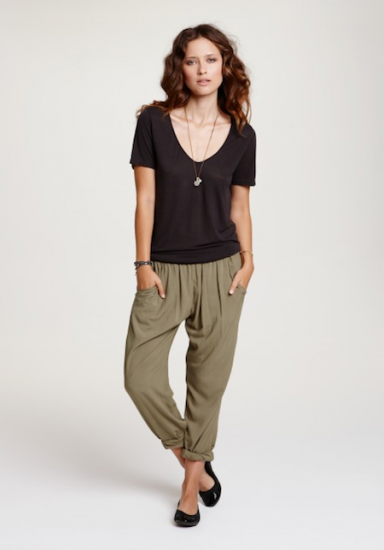 Comfy, slouchy trousers in army green and a simple black t-shirt with just the right amount of neck scoop. My other Hush basics (wrap skirt, cotton dresses, colourful sweaters) have pretty much seen me through the whole of spring and summer this year, which is why I’ve become evermore obsessed with checking the sale – you can never have enough quality basics to mix and match! What do you think? It was a very rash little spending session (total of £38, so not too naughty!) but I hope that the trousers will be useful. 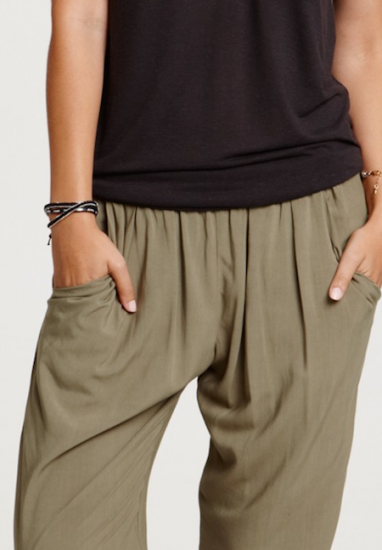 I love the draping around the front – very flattering – and I’ll definitely be wearing them rolled up at the bottom. Not so sure about the styling with ballet flats – it’ll be sandals or flip-flops for me. You can find the Veronica trousers here – they do a few different colours and are reduced from £45 to £20. Sorry to just pull images from their site, but obviously I haven’t received my clothes yet! I’ll let you know when I do – I just wanted to post about them now because I think the sale is in its last death throes. So, photos to follow. Previous Post Why I Love Tubes of Stuff. Next Post How to Concentrate and Get Things Done.